For 15 years Doctor Jack Stark plied his wares in the Athletic Department’s hallways, nooks and an astounding caseload of players’ crannies. Truly an Eminence Outlier, I recall many a day when -seemingly out of the blue- he would appear after a practice or before a game to sidle up to a player and share a notion, an encouraging word, place a vision of the success in a kid’s mind’s eye in anticipation of a payoff when the stress was high and clock was running down. Still in demand by a variety of high profile suitors, I caught him on a bad phone connection with a terribly sore throat and cutting headache that night. Trying to make our conversation quick for his health’s sake, I ended the interview far earlier than I would have wished. But then again, a little medicine from the Doc is better than none at all, wouldn’t you agree? Question: Hey Doc, what are you up to these days? Dr. Jack Stark: Keeping busy. Doing some consulting work, doing some volunteer work, doing some things with NASCAR right now. So its keeps me out of trouble. Q: Take me back to ’91, before you started working with the team. JS: I actually started in the ‘89 season: Spring of 1989. The first two years it was just trying to get them to know me and trust me. And as you know, there were a lot of confidentiality issues and stuff that goes on, a lot of people not really knowing me, trust issues. So it really took me all of ’89 and ‘90 to get to know people. There were some people there before me and, honestly, the players didn’t trust one of the guys; so that really took some work. ’90 was a really difficult year, and I started doing a lot more work in ’91. With Coach Osborne it was wonderful to be and work with a guy who knew what I wanted and trusted me to let me do my thing. Q: Where were you working with prior to 1989? JS: I was working with the medical school here in Omaha and I was also working in my private practice in town. I went to school at Nebraska and received a degree in Psychology and graduated in ’73. In ’89 I was working full-time and then came down and put in about 25 hours a week at Nebraska. Q: Were you involved in Sports Psychology before joining the team? JS: Yeah, I’d been working with UNO in the ’70’s and worked with everything from golfers to teams for high school, college kids, some pros. Individual stuff, mostly. 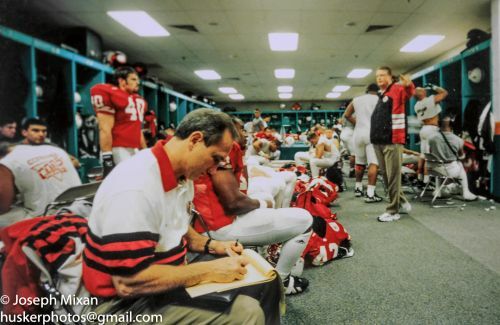 Then there was an organization in Florida, and I had been down there giving some talks and they recommended me, so in January of ’89 I met Coach Osborne and started doing what was supposed to be 10 hours a week. But after that I realized there was a lot of work to be done, so we moved it up to 25 hours a week. I was commuting from Omaha and would come down on Tuesdays and Thursdays and Saturdays. And that continued all summer long, and then it just worked into being all year-round. There were no formal workouts, but I still hung around after their workouts and talked to them one on one. It was a great time because they weren’t so busy, so I was able to get to know them and who they were and build a relationship with them. Q: Place me -as a fly on the wall- in your first meetings with Coach Osborne. JS: Well, I made a presentation to all the coaches in a meeting there, and afterwards just spoke to Coach one on one. I didn’t know how to engage them, but from the meeting and my presentation the staff found that I was very competitive, that I had some fire. Coach Osborne had always had somebody he’d used…he’d used a female psychologist on campus in the past, too. (And I don’t know if you know it, but Coach Osborne has his own PhD in Psychology, so he always appreciated that, the personal side of psychology.) So I was fortunate and a little different than most people in that I had a number of experiences in educational psychology, sports psychology, clinical psychology, team building and organizational psychology, so I had all those experiences I could use. Q: How many college football teams had a sports psychologist at that time? JS: Oh, probably less than 3 or 4, and they were only part-time. And at that time it was really hard to work with teams, because so many people had little regard for sports psychologists. The old model didn’t work very well because they thought of us as ‘head doctors,’ they thought it was a little hokey. So what I tried to do was spend some time getting to know everybody other than getting to be known as ‘the guy who you went to when it came to dealing with problems.’ I was also the guy who dealt with the sports psychology and that was a big difference. Q: Can you elaborate on that statement? JS: There were a lot of psychologists out there who liked to present themselves as ‘sports psychologists’. First of all, it’s a very tough field; there’s a lot of fakes in my field, a lot of pretenders. They might have a PhD in an area, and most who say they are in sports psychology came out of some exercise physiology or physical education department, so they’re not a psychologist, but an exercise physiologist who comes at it from the mental side. What I found was that the job was mostly dealing with issues and problems. Q: You once said that as many as 40% of college students are dealing with psychological issues. Would that figure still apply today? JS: Oh, yes. And not just athletes, that’s all students. And some people think that many athletes have mental health issues and don’t deal with stress well, but these players are just like any other college student; it’s just that when a typical student has an issue of some sort it doesn’t make the newspaper. JS: Yeah, that’s why team peer pressure is so critical. That’s where team leaders have to exhibit leadership. Senior leadership is always so critical. If you don’t have that nucleus -because coaches can’t always be around- it’s important to have that peer pressure in the locker room. Q: And if memory serves, was the Unity Council your brainchild? So we started meeting and kept working at it and it was great, just a lot of fun. Boyd Epley had an idea of some points. We used that for a while, for missing classes and stuff like that. We didn’t always use it, but it was a great way of keeping track of things, though we didn’t need it after a while. Q: You said players weren’t getting along. What was the primary cause of that? JS: You had offense versus defense, in-state versus out-of-state, black versus white, walk-on versus scholarship, you could have all sorts of things that can divide a team. But the good thing was that we got it all organized. The kids just said, “Hey, we’ve gotta stop this thing”, and it took 4 years to get it under control. Q: Boyd said he thought a great start was the team meeting in early ’91 before winter conditioning, and I’ve also read where you felt halftime of the Citrus Bowl after the ’90 season -when Kenny Walker gave Coach Osborne a big hug- maybe that was a huge turning point for the team. What do you say to that? JS: Well, it was halftime and Coach had talked to the team. And he just had had it: we were playing terrible, we weren’t ranked. And I have to give it to Coach, when it came to that next summer he didn’t take any vacation. He just cranked it up and basically looked at me and said, “It’s going to work now. Right now.” He went in there and had some meetings and basically said, “This better work. If you don’t, we’re not doing it anymore.” Essentially saying that, “If it doesn’t, you’re fired.” (laughs) That was early in ’91. JS: I think it peaked in those years all the way up to ’97. That’s when we had the best leaders we’ve ever had. You had Jason Peter and Grant Wistrom. Just the greatest, two at the same time. You also had Christian Peter before that, who was a great leader in the locker room in ’94 and ’95, but in the final two years, those two guys really continued it. And it ran in a progression in further years with other guys. And when I had my heart surgery I didn’t work the last two months of that year and just kind of slept in. I had to make some changes, wasn’t quite as involved. And of course I left after the Colorado game in 2003 when they got rid of Frank Solich, I didn’t want to have anything to do with it. Q: Any other leaders come to mind from those teams? JS: Well, each year you had people who became great leaders. All the way through the ’90’s it seemed each year there would be 2-3 guys out of 16-17 guys were great leaders, and they were the ones that really carried it. Terry Connealy, Chad Kelsay, Aaron Graham were natural leaders. Over the years -I’m trying to think- it seemed like we always had good leaders.